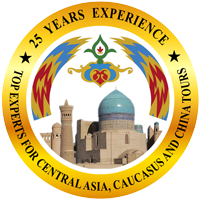 Treasures of 5 Central Asia "Stans"
Follow in the footsteps of Marco Polo! 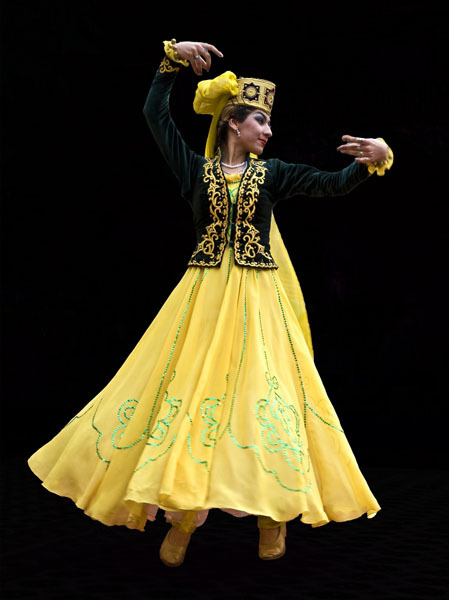 Uzbekistan, Kazakhstan, Turkmenistan, Kyrgyzstan, Tajikistan...The countries of Central Asia are what we know best! Come tour with us to the heart of the ancient Silk Road. Its as authentic as it gets here - ancient traditions and thousands of years of history found across the vast steppes and pristine mountain ranges, in soaring minarets and turquoise domes, desolate desert sands, the flash of traditional silk and silver, intricate designs on rich, hand-woven carpets, and the excitement of modern urban capitals. Enjoy the warmest welcome in the world! 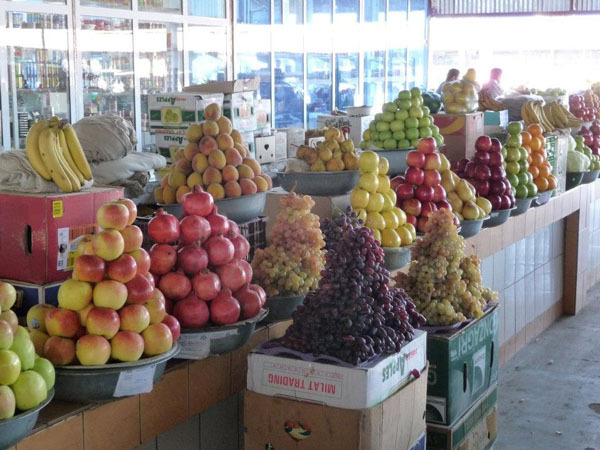 Fall is one of the best seasons of the year in Central Asia with its warm and pleasant sunny days, abundance of mouth-watering tasteful fruit and vegetables, and colorful Festivals and cultural events. 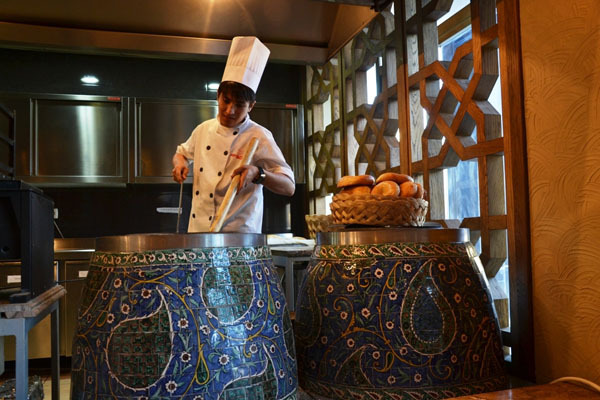 Experience the warmest welcome in the world and try national dishes and regional variations in 5 different countries. 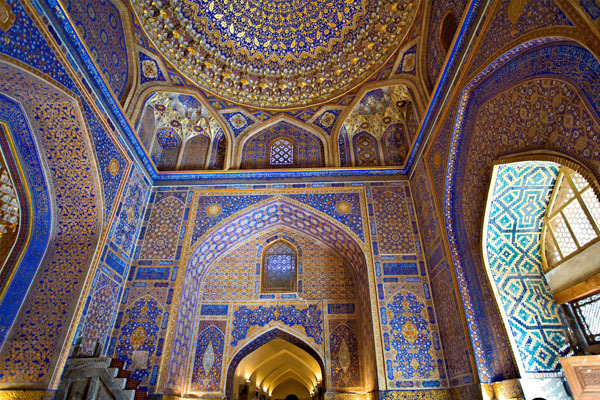 Come tour with us to the heart of the ancient Silk Road! Participate at seasonal and traditional festivals, and travel to some of the world's most beautiful and rarely visited locations with local Guides. 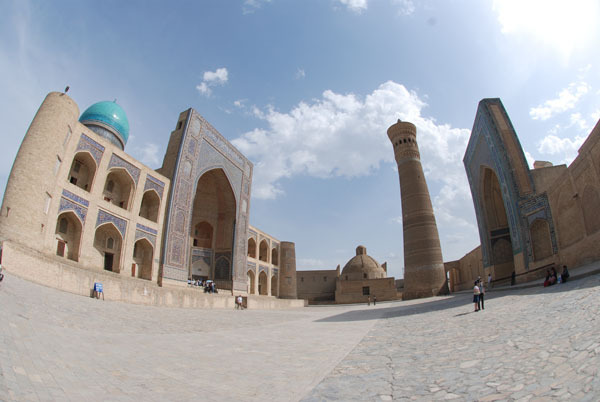 Our special offer: Book this Tour before April 30th and get $ 200 discount per person and a Special Legendary Khiva Lunch. Welcome to Tashkent! A fascinating mix of Soviet and new, sprinkled with the medieval. You will be met by our representative at the airport and transfer to your hotel for your first taste of the legendary hospitality of Central Asia. Please let us know if there's anything you need! 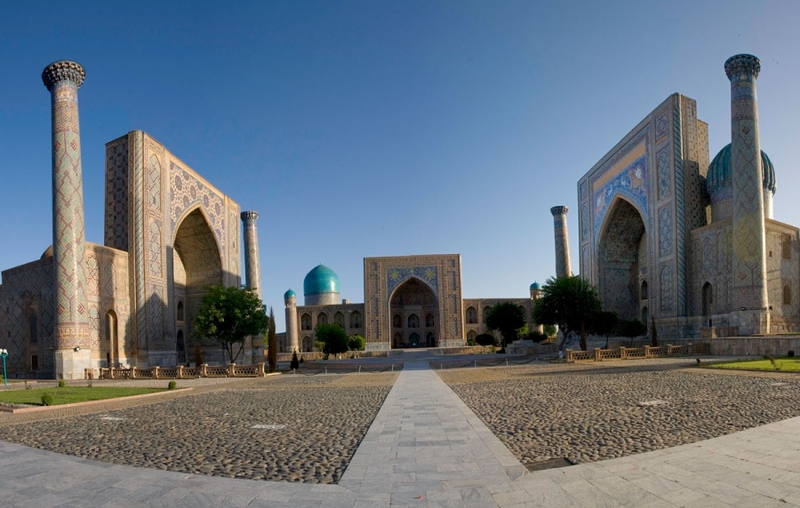 Start the day with a sightseeing tour in ancient Tashkent. Much of the capital city did not survive the 1966 earthquake and subsequent Soviet reconstruction, but there's so much to see! The 16th c. yellow brick Kukeldash Medresseh was built in the 16th century and later used as a caravansary, fortress and museum. It's near the busy Chorsu Bazaar, meaning 4 directions, as the roads from the city's original main gates all crossed here. 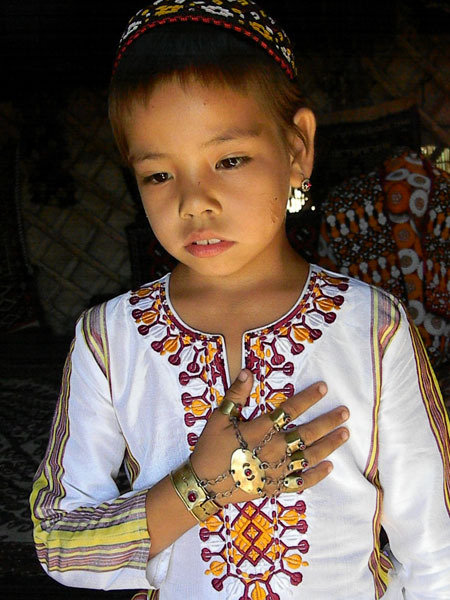 It's the perfect introduction to daily life in Uzbekistan. 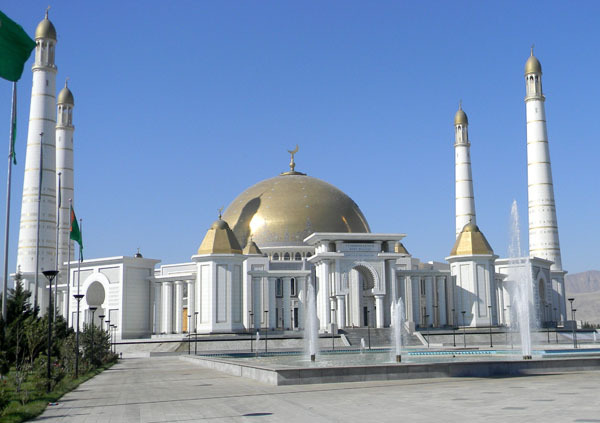 Kaffal Shashi is the patron saint of Tashkent and his mausoleum is part of the Hazrat Imam complex which houses the oldest Koran in the world and the Barak Khan Medresseh, now a lovely collection of workshops for a variety of traditional artisans. We'll see Mustakillik Square (Independence Square) and Amir Timur Park. Then join us for a Welcome Dinner and toast to our journey together. Sightseeing morning drive to Oybek, for a taste of Tajikistan. After border formalities we'll drive to Khodjent, one of the most ancient cities of Tajikistan, the northernmost outpost of Alexander the Great and a major stop on the Silk Road routes. Set against a backdrop of green hills and snow-capped mountains, we'll visit the Temurmalik Fortress and the museum of Archaeology and History there. The traditional Panchanbe Bazaar is the social hub of the city offering a delightful market experience. With fifty types of tea and over a hundred types of spices, it offers everything imaginable including handicrafts and artworks. We'll return to Tashkent for dinner. Sightseeing drive to legendary Samarkand! Make a stop near the "gate" of Amur Temur where two mountain ranges meet for spectacular photo ops. 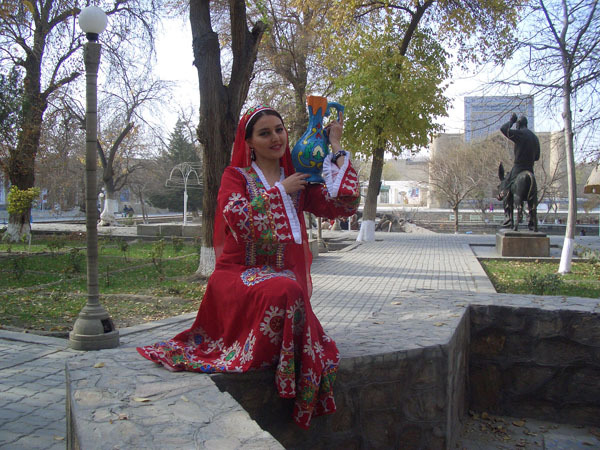 Tour Registan Square, the main attraction of Samarkand with its three fabulous medressehs. There are majestic doorways, turquoise domes, gilded ceilings, majolica facades and tile and specialty handicraft workshops of course! In this city of scholars, the remains of astronomer Ulugbek's 15th century observatory dwarf the imagination. 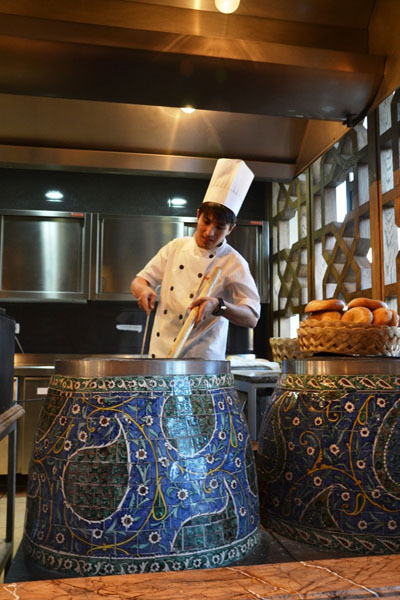 Try the plov in Samarkand, its made with dried fruit and nuts here! After breakfast at the hotel, we'll visit the Hebrew Prophet Daniel's Tomb, the old Jewish Quarter and synagogue in Samarkand, one of the oldest inhabited cities of Central Asia and Emir Temur's capital. 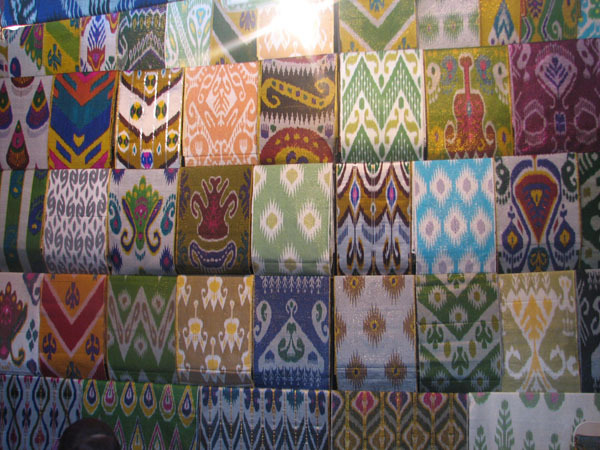 Stop in at the main Samarkand bazaar before lunch at the hotel. Continue the afternoon with more medieval sites and impressive architectural achievements: the tilework wonders of the necropolis of Shah i Zinda, the Bibi Khanum Complex (built in honor of the wife of Amir Timur in the 14th c.), and learn about Timur's warning at the Gur i Emir (Tomb of the King) Mausoleum of the mighty Timurid Dynasty. This masterwork was a precursor to the great tombs like the Taj Mahal in India. 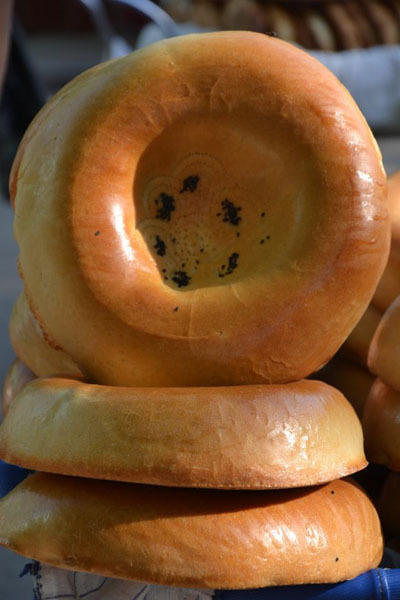 As everywhere in Uzbekistan, the bread in Samarkand is distinclty different, so delicious! After dinner, there's an exuberant folklore show in Registan Square. 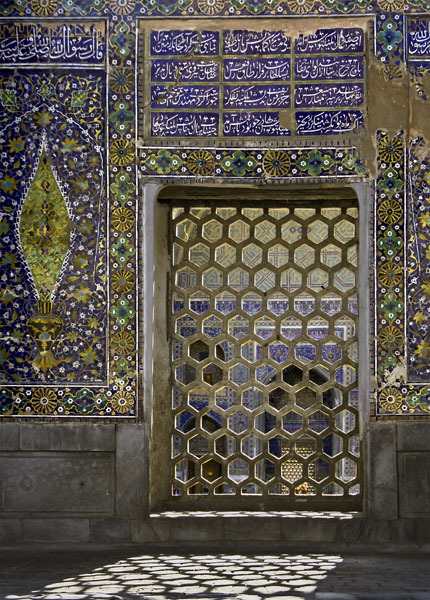 In the evening, the tilework takes on darker mysterious hues hearkening back to its more gruesome past, then suddenly comes alive with a colored light show across the Tillya Kori facade. Drive to Bukhara taking in the black sand of the Malikchul desert and the Zerafshan River. Stop at an ancient caravansarai gate and then lunch at the Gijduvan Ceramic Center. Family run, this is one of the principal schools of ceramics in Uzbekistan. Once in Bukhara, we'll check in at our hotel and walk out through the historical core of Bukhara where few vehicles are allowed. This oasis city was once a major center of trade and the arts, and our first stop is the Labi Khaus Complex, the buildings and shaded pond at the heart of the old city. 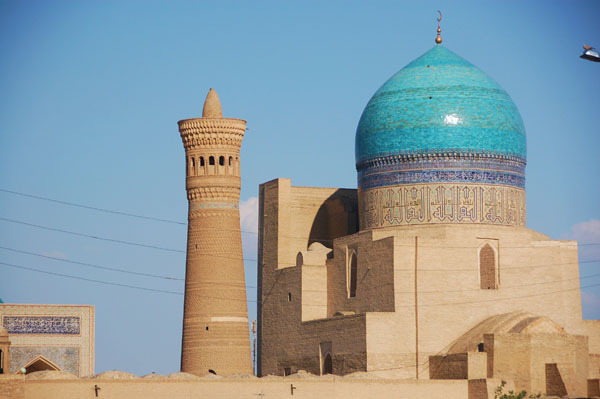 We'll explore the serene desert architecture of Bukhara at the medieval Nadir Divan Begi Madreseh, the Khanaka Nadir Divan Begi, and the Magoki Attari Mosque. 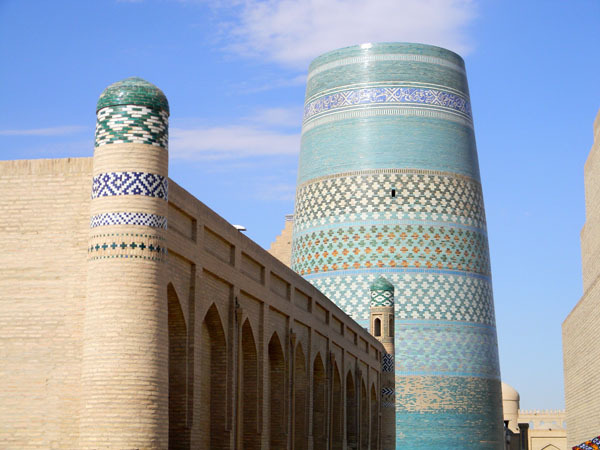 We'll have plenty of time to wind through the extensive covered markets under the "toks" or trade domes of the bazaar to end up at the beautiful 12th c. Poi–Kalon Complex and the legendary Kalyon Minaret, the iconic landmark of Bukhara. 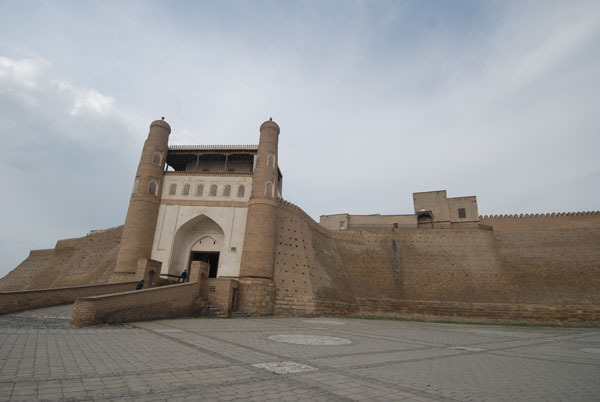 There's thousands of years of history and culture here, so we'll start today at Bukhara's Fortress-Ark which dates from the 1st century; its a step back in time to when this was a fortified city. 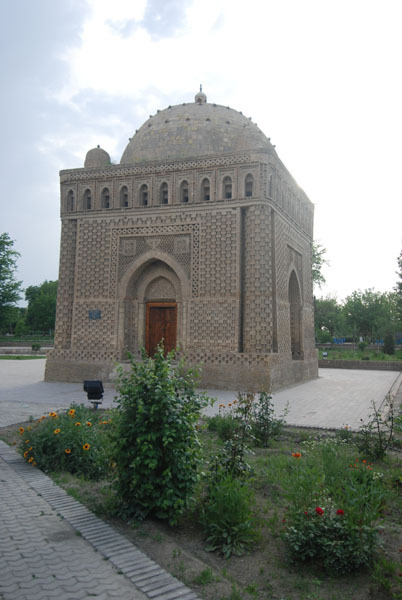 The Ismail Samani and Chashma-Ayub Mausoleums are significant examples of medieval architecture, and the Chashna-Ayub houses the sacred well of Job, said to be the place of Bukhara's origin. 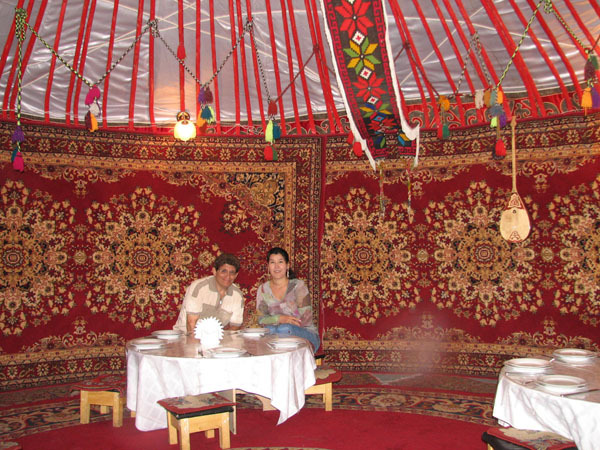 We're invitede to lunch at the home of a local Uzbek family, to chat, relax and enjoy this off-the-beaten path experience. Afterwards, we'll explore the Palace of the Moon and Stars, the summer residence of the last Emir and the 4 distinctive minarets of the small Chor Minor madresseh. 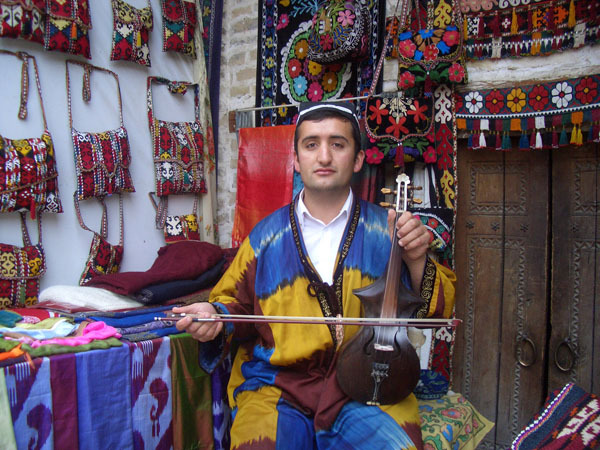 There will be dinner with a folk-show of music, dance and traditional costumes in the Nodir Divan Begi medresseh. Don't forget to try the spiced tea in Bukhara! Border crossings in Central Asia are such a fabulous window into the life, politics and economies here. 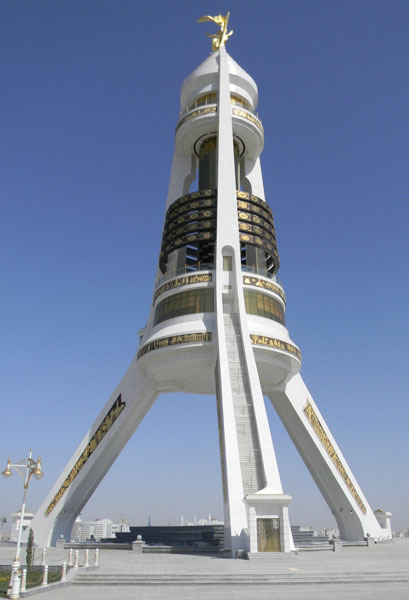 We'll complete customs and border formalities at the Turkmenistan border at Farab, then continue on to the city of Mary (Mah-ree) through the Kara Kum desert and the Floating Bridge. Photo opportunities of spectacular desert scenery abound here. Mary is the jumping off point for tours to the ancient settlement of Merv. In late afternoon we'll tour the regional Mosque and the Central Theater and get a taste of what life is like in this relatively unexplored country. 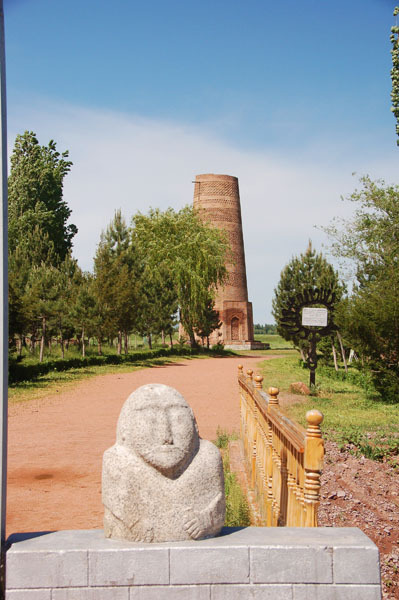 Once known as Margiana - the largest city in the world, Merv is one of the best preserved Silk Road sites with a history spanning 4,000 years. The current ruins comprise at least six settlements from various eras and is listed as a UNESCO World Heritage Site. Explore the Mausoleum of Sultan Sanjar and the Gyz-Gala fortress. Evening flight to Ashgabad, capital of Turkmenistan. The ruins of Nissa, the ancient capital of the Parthians are the starting point for our discoveries today. The unique fortresses, citadel, temples and tombs of the imperial city date from the 3rd c. BC and lie just on the outskirts of Ashgabad. The sky above Ashgabad seems an endless blue, broken only by the marble and gold monuments. Even the phone booths are resplendent in white and gold and the city holds the world's record for most white marble used in construction. 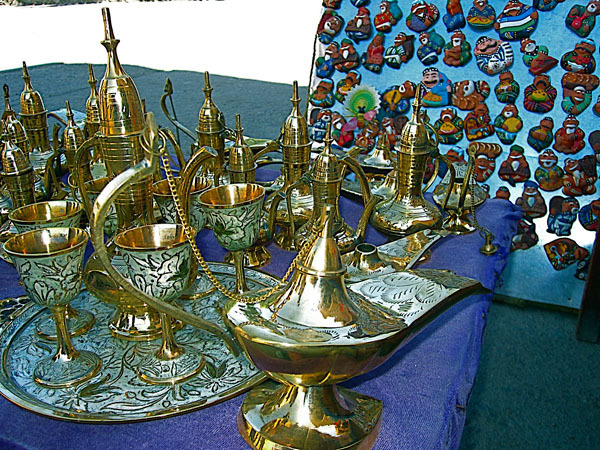 We'll view the treasures at the Museum of History and Ethnography and tour the Blue Mosque and Independence Park then uncover some treasures of our own at Ashgabad's Talkuchka Bazaar. One of the largest open bazaars in the world, it's filled with colorful rugs, jewelery, carpets, silk and national Turkmen costumes. 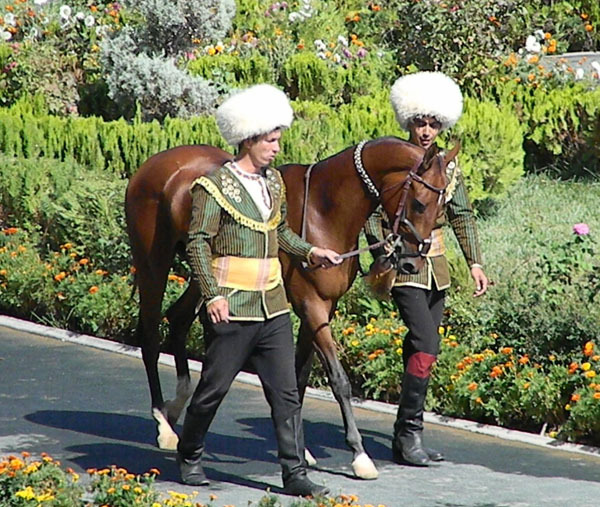 We'll also visit the park dedicated to the famed Akhalteke Horses, see Presidential Square, the Monument for the Victims of the 1848 Earthquake, and one of the few remaining monuments to Lenin in Central Asia. Dinner at a traditional restaurant. After dinner, the city lights up with colorful displays at its monuments and capital buildings. 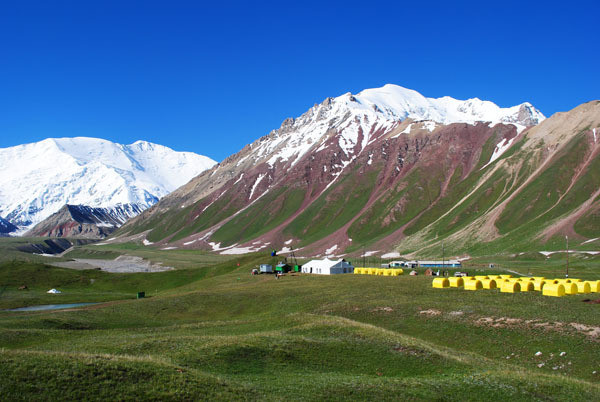 Fly to Dashoguz and drive to Kunya Urgench to explore this ancient Silk Road city at the crossing of the caravan routes between China and Russia. 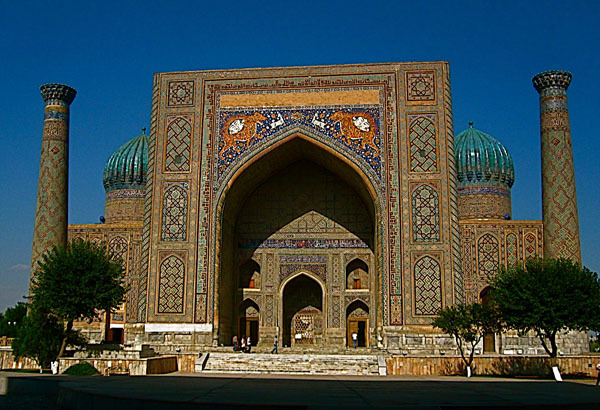 The city's reputation for learning allowed it to eclipse Bukhara until they dared defy Chinggis Khan. The Mausoleum of Turabeg Khanum and the shrines of Soltan Tekesh and Il-Arslan are fine examples of unique Islamic architecture. We'll cross back into Uzbekistan after border formalities and experience the nomadic life overnight in the desert yurt camp at Ayaz Kala. 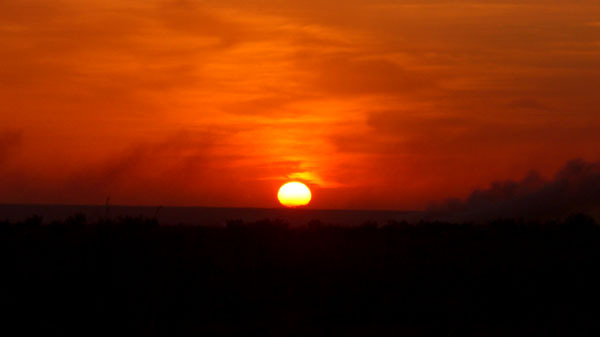 It's an opportunity for beautiful sunset photography, entertainment at the campfire, and a sky full of stars. Options for enjoying the desert this morning include a ride on a camel, some light hiking, photography or just relaxing around the camp. 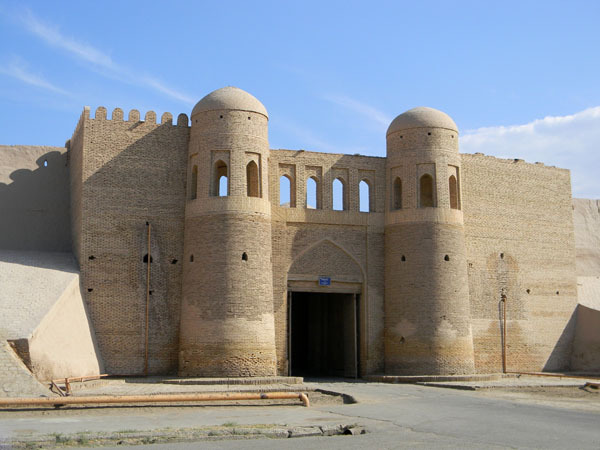 Our afternoon drive takes us to legendary Khiva, Uzbekistan's "Living Museum". This walled medieval city offers fascinating walks through narrow streets of adobe walls which change color with the setting sun. There's an optional folklore show after dinner. 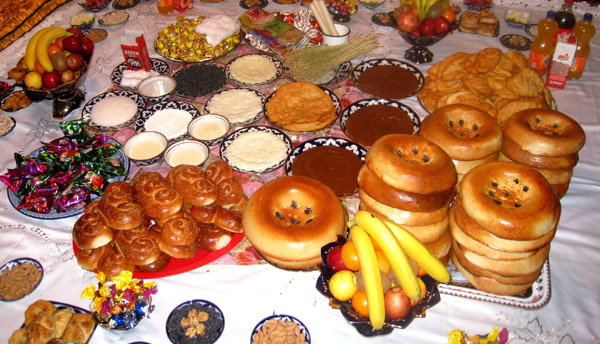 In Khiva make sure to try the local specialties including the dill-flavored noodles. 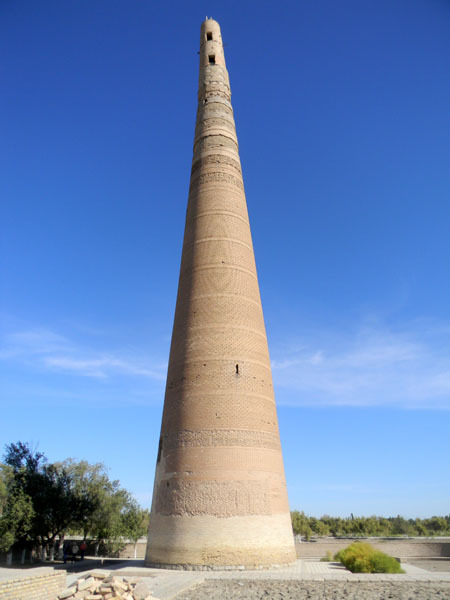 Khiva was the former capital of the Khanate and legend says that it was founded by Shem, the son of Noah. The daytime streets are lively with artisans, souvenir sellers and fellow travelers, much as it was when all caravans passed through here on the way to China. The Ichan Kala (Old City), is surrounded by high walls of air-dried bricks and decorated with delicate majolica tile in lovely shades of green and turquoise, wonderfully restored during Soviet rule. Every site and monument here is unique; the Ata –Darvaza (West Gate), the short, squat looking Kalta Minar minaret, the medresseh of Mohammad Amin, the Kunya Ark, the Pahlavan Mahmud Mausoleum with its tiled proverbs, the Khodja Islam medresseh and its minaret - the tallest structure in Khiva.The Tash Hauli Palace has a few remaining rooms to see in the harem area, and through the doors of the caravansarai built high enough for camels you'll find the "tim" or bazaar. There's a peaceful, cool retreat amongst the 200 carved pillars of the Juma Mosque before our evening flight returning to Tashkent. Tashkent is a main transportation hub and we'll catch a flight to Almaty, Kazakhstan today, situated at the foot of the northern Tyan Shan Mountain range. We'll visit the imposing Central State Museum in this former capital, then Almaty's Green Bazaar. Look for apples here, they still grow wild in Kazakhstan. The hundred year old Cathedral of the Holy Ascension was built to withstand earthquakes, entirely of wood and without nails. Panfilov Park is named in honor of Kazakh soldiers in WWII who defended Moscow. It's a fascinating piece of Soviet history and the war memorial there is a popular location for wedding photos. A quaint wooden house nearby houses the Museum of Musical Fok Instruments of Kazkhstan. We'll also explore Independence Monument, with its winged snow leopard and bronze statue guardians from Kazakh history. Finally, Alatau Park in the foothills just outside the city offers us a refreshing pause for fabulous views of the city and the surrounding mountains. Overnight in Almaty. 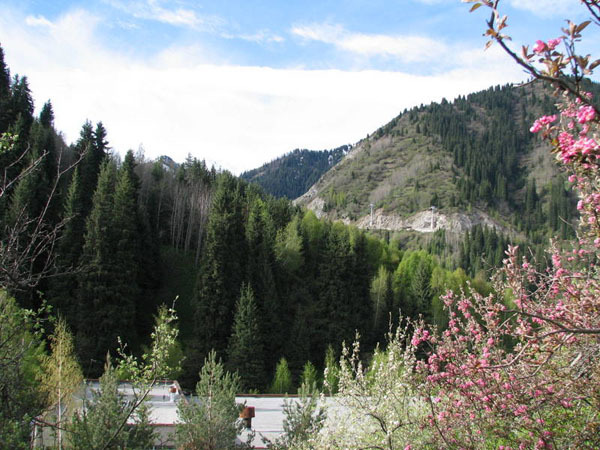 From Almaty, we'll cross the border and drive to Bishkek, the capital of Kyrgyzstan. Like Kazakhstan, this is a land of nomadic traditions (think horses, yurts and colorful felt handicrafts) but Bishkek grew up as a Soviet city. Relatively small, but pleasant and green, Bishkek includes a great many parks along with its monuments which encourage lingering awhile, chatting with local residents and enjoying the dumplings! We'll see Oak Park with its open air sculptures, Ala-Too Square and the bronze statue of the legendary hero Manas. 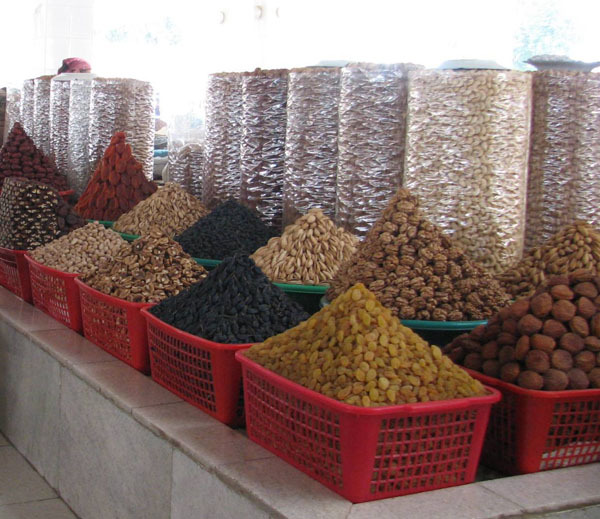 We'll visit the State Historical Museum (there's another statue of Lenin here and some fine Soviet propaganda) and the bustling maze of the Osh bazaar (try the dried dates!). 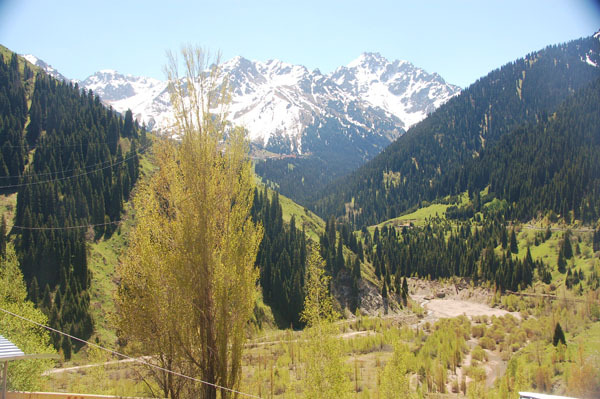 This incredibly beautiful country spreads out in front of us on our sightseeing drive to Issyk Kul Lake. Stopping at Burana Tower overlooking the ruins of ancient Balasagun City, you can climb the tower for a view from the top. Issyk Kul is one of the largest and deepest high altitude lakes in the world, saline and completely ringed by the snow capped Ala-Tau Mountains. Issyk-Kul means "warm lake" and is a popular resort destination. There are beaches, short hikes and a lake tour to enjoy before a relaxing overnight. On the return to Bishkek near Issyk-kul, are the picturesque Cholpon-Ata gorges and a "stone garden" of low boulders, some embellished with ancient petroglyphs. Then it's time for final packing, perhaps some last minute souvenir shopping and our farewell dinner with a cultural show here in Kyrgyzstan. Thank you for traveling with us! It's been our pleasure to introduce you to our family and friends and the beauty of our homeland. Departures from Bishkek International airport.